The farewell ceremony, attended by more than 1,000 people, featured retired Capt. Fred Wilmot, a former Prowler test pilot who delivered the first of the aircraft to Whidbey Island in January 1971. He was also a passenger on the last Prowler to fly at Whidbey Island. “The fact that the Prowler stuck around for 45 years is testimony to how well it was designed and built and the thousands of men and women who have maintained and operated it,” Wilmot said. 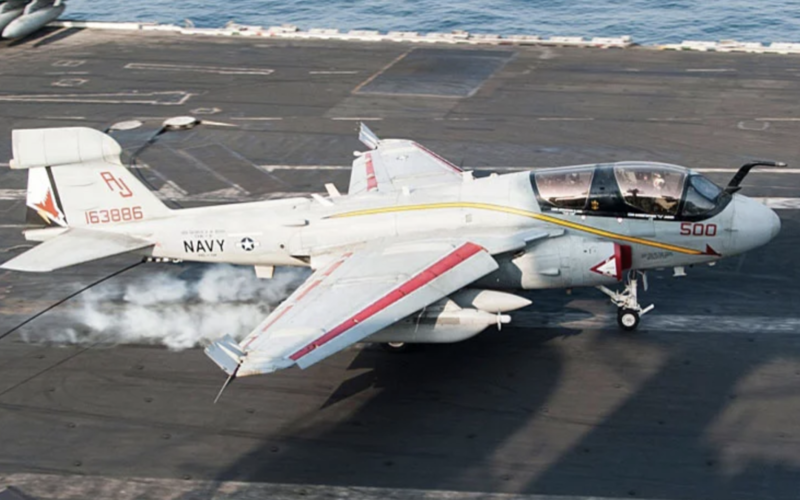 The Prowler was the Navy and Marine Corps’ primary electronic warfare aircraft, performing electronic surveillance and jamming enemy radar and communications. The aircraft made its first flight May 25, 1968, went operational in July 1971 and made its first deployment, to Southeast Asia, in 1972, according to the Navy. It has seen action in Operation Desert Storm in 1991, supported NATO operations in Bosnia-Herzegovina and Yugoslavia and enforced no-fly zones around Iraq. With the Prowler’s retirement, the Electronic Attack Squadron at Whidbey Island will transition to the EA-18G Growler aircraft, a variant of the F/A-18F Super Hornet Block II, Navy officials said.